At a rugby match there are many things we all perhaps take for granted - the hours of training, coaching, ground preparations and equipment installations that are required to get a rugby venue ready for the masses, all of which have a background story of planning and hard work. The same is true of the posts at either end of the pitch, a particular aspect we have much experience in handling as the leading manufacturer of rugby posts in the UK. Following our previous experience supplying numerous colleges, clubs and universities across the country we have witnessed groundsmen battle all types of weather condition to install posts up to 17m in length -a potentially dangerous and often disconcerting prospect for all involved. With safety an emotive issue that the sports industry has always been fully committed to, we have invested in designing and manufacturing industry-leading aluminium post designs and assembly options to help ease the weight and pressure created by a groundsman's pre-match job list. With these large structures being crucial to the staging of a rugby game, we have introduced our latest product to the assembly range, the hinged rugby post lifter, thus minimising the effort needed to erect them. The hinged rugby post lifter has specifically been designed for use with an appropriate tractor, and enables the safe installation and dismantling of Harrod UK rugby posts. 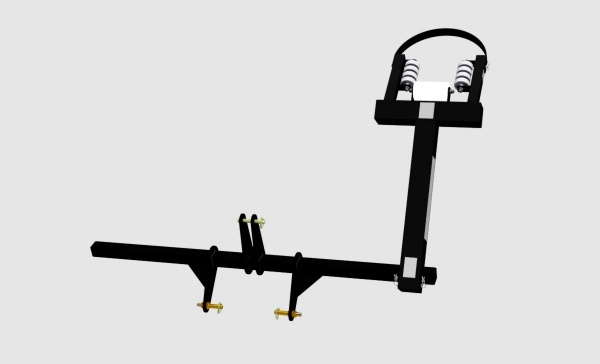 Key design features of the assembly device are its reversible nature which allows it to be used on the left and right hand side of the tractor and ability to work with both categories one and two (3-point) linkage arms. The device enables the upright to effectively move along the rollers in a controlled manner to the side of the cab for added safety. We would recommend that a minimum of two people oversee the process ensuring that the tractor's speed never exceeds walking pace; moving no faster than 3mph. The item is designed for use with hinged uprights only therefore would recommend you purchase hinged adaptors should you wish to utilise this product with existing Socketed posts in order to simplify regular installation. 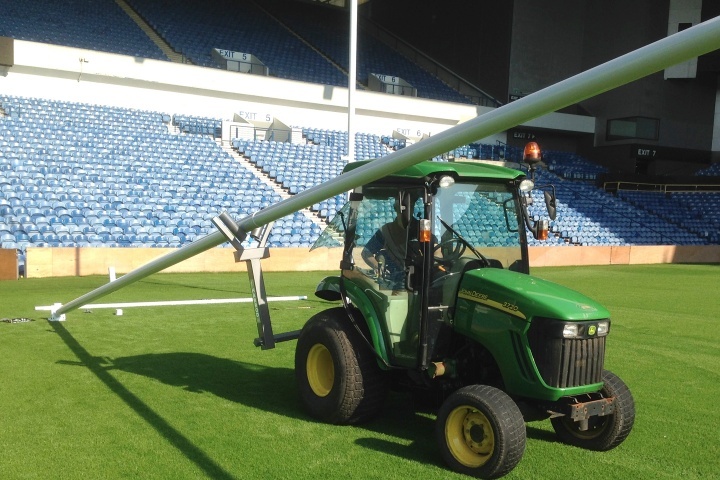 Check out our video below of the lifter in use at the Ibrox stadium, as the venue prepared for the Glasgow 2014 Commonwealth Games. John Robinson, Sales Development Manager at Harrod UK, describes how important the new machine is to the industry: "The new rugby lifter innovation will benefit clubs, schools and councils who may be less experienced with the assembly of equipment this large. We hope they will now be able to use the lifter to erect and dismantle each rugby post both safely and effortlessly."